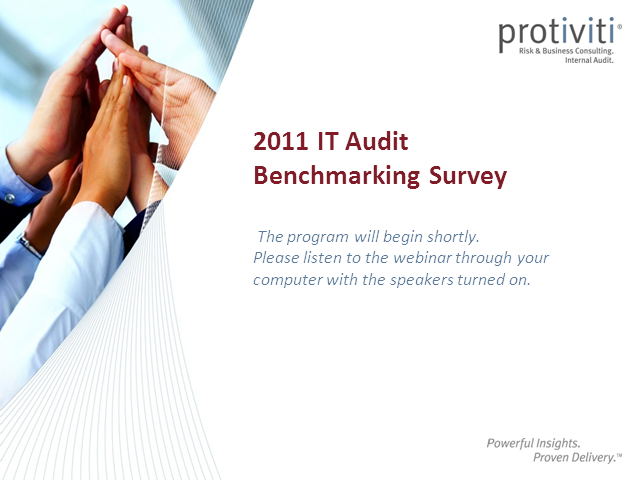 Please join us for a complimentary webinar, The 2011 IT Audit Benchmarking Survey. Protiviti's 2011 IT Audit Benchmark Survey webinar will present the results of a survey conducted of nearly 500 practice professionals to gain insight into the current state of IT Audit. The presentation will discuss the areas where the profession is doing a good job, and those areas where the profession needs to improve to be compliant with the both the standards, and management's expectation of reasonable assurance.